Alan Shearer, CBE, DL (/ˈʃɪərər/; born 13 August 1970) is an English retired footballer. He played as a striker in the top level of English league football for Southampton, Blackburn Rovers, Newcastle United and the England national team. He is Newcastle's and the Premier League's record goalscorer. [notes 1] He was named Football Writers' Association Player of the Year in 1994 and won the PFA Player of the Year award in 1995. In 1996, he was third in the FIFA World Player of the Year awards. In 2004 Shearer was named by Pelé in the FIFA 100 list of the world's greatest living players. Shearer scored 283 league goals in his career (all in the first tier of English football), including a record 260 in the Premier League[notes 1] (of which 58 were penalties) with a joint record 11 Premier League hat-tricks, and a total of 422 in all competitions including international at all levels. Until his retirement from international football in 2000, he appeared 63 times for his country and scored 30 goals. Shearer had a goals-to-game ratio of 0.667 throughout his career. Since retiring as a player in 2006, Shearer has worked as a television pundit for the BBC. In 2009, he briefly left his BBC role to become Newcastle United's manager in the last eight games of their 2008–09 season, in an unsuccessful attempt to save them from relegation. Shearer is a Commander of the Order of the British Empire (CBE), a Deputy Lieutenant of Northumberland, a Freeman of Newcastle upon Tyne and an honorary Doctor of Civil Law of Northumbria and Newcastle Universities. Shearer was born in Gosforth, Newcastle, in 1970 to working-class parents Alan and Anne Shearer. His father, a sheet-metal worker, encouraged a keen Shearer to play football in his youth, and the young player continued with the sport as he progressed through school. He was educated at Gosforth Central Middle School and Gosforth High School. Growing up playing on the streets of his hometown, he originally played in midfield because "it meant [he] could get more involved in the games." Shearer captained his school team and helped a Newcastle City Schools team win a seven-a-side tournament at St James' Park, before joining the amateur Wallsend Boys Club as a teenager. It was while playing for the Wallsend club that he was spotted by Southampton's scout, Jack Hixon, which resulted in Shearer spending his summers training with the club's youth team, a time he would later refer to as "the making of me". Shearer had successful trials for First Division clubs West Bromwich Albion, Manchester City and Newcastle United, before being offered a youth contract with Southampton in April 1986. Shearer was promoted to the first team after spending two years with the youth squad. He made his professional debut for Southampton on 26 March 1988, coming on as a substitute in a First Division fixture at Chelsea, before prompting national headlines in his full debut at The Dell two weeks later. He scored a hat-trick, helping the team to a 4–2 victory against Arsenal, thus becoming the youngest player – at 17 years, 240 days – to score a hat-trick in the top division, breaking Jimmy Greaves' 30-year–old record. Shearer ended the 1987–88 season with three goals in five games, and was rewarded with his first professional contract. Despite this auspicious start to his career, Shearer was only eased into the first team gradually and made just ten goalless appearances for the club the following season. Throughout his career Shearer was recognised for his strength, which, during his time at Southampton, enabled him to retain the ball and provide opportunities for teammates. Playing as a lone striker between wide men, Rod Wallace and Matt Le Tissier, Shearer scored three goals in 26 appearances in the 1989–90 season, and in the next, four goals in 36 games. His performances in the centre of the Saints attack were soon recognised by the fans, who voted him their Player of the Year for 1991. In the middle of 1991, Shearer was a member of the England national under-21 football squad in the Toulon Tournament in Toulon, France. Shearer was the star of the tournament where he scored seven goals in four games. It was during the 1991–92 season that Shearer rose to national prominence. 13 goals in 41 appearances for the Saints led to an England call-up; he scored on his debut, and was strongly linked in the press with a summer move to Manchester United. 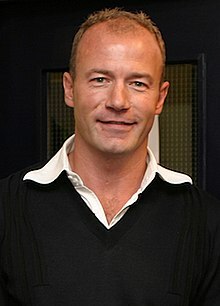 A possible move for Shearer was being mentioned in the media during late autumn of 1991, but he rejected talk of a transfer and vowed to see out the season with Southampton, resisting the temptation of a possible transfer to the two clubs who headed the title race for most of the season. Speculation of a transfer to Liverpool, who finished the season as FA Cup winners, also came to nothing. During the middle of 1992, Southampton's manager, Ian Branfoot, became "the most popular manager in English football", as he took telephone calls from clubs "trying to bargain with players they don't want plus cash". Although Branfoot accepted that a sale was inevitable, he claimed that "whatever happens, we are in the driving seat". In July 1992, Shearer was sold to Blackburn Rovers for a fee of £3.6 million, with David Speedie reluctantly moving to The Dell as part of the deal. Despite Branfoot's claim to be "in the driving seat", Saints failed to include a "sell-on clause" in the contract. Shearer, less than a month off his 22nd birthday, was the most expensive player in British football. In his four years in the Southampton first team, Shearer made a total of 158 appearances in all competitions, scoring 43 goals. Despite making just one goalless appearance as England failed to progress past the Euro 1992 group stages, Shearer was soon subject to an English transfer record-breaking £3.6 million bid from Blackburn Rovers. Although there was also interest from Manchester United manager Alex Ferguson, Blackburn benefactor Jack Walker's millions were enough to prise the striker from the Saints, and Shearer moved north to Ewood Park in the middle of 1992. His first season with Blackburn was mixed – he missed half of it through injury after snapping his right anterior cruciate ligament in a match against Leeds United in December 1992, but scored a prolific 16 goals in the 21 games in which he did feature. Shearer also became a regular in the England team this season and scored his second international goal; it came in a 4–0 1994 FIFA World Cup qualifier win over Turkey in November. The season ended sourly, however, as Shearer was forced to miss January through to May due to injury and England's World Cup qualification chances were hit by a run of poor form. Returning to fitness for the 1993–94 season, he scored 31 goals from 40 games as Blackburn finished runners-up in the Premier League. His performances for the club led to him being named the Football Writers' Association Footballer of the Year for that season. On the international scene, England had failed to qualify for the 1994 World Cup finals, but Shearer added three more goals to his international tally before embarking on his most successful domestic season as a player to date. The arrival of Chris Sutton for the 1994–95 season established a strong attacking partnership at Blackburn. Shearer's 34 goals coupled with Sutton's 15, helped the Lancashire club take the Premier League title from archrivals Manchester United on the final day of the season, and the duo gained the nickname "the SAS" (Shearer And Sutton). After being asked by the press how he planned to celebrate winning the title, Shearer replied with "creosoting the fence". Shearer also had his first taste of European football in the UEFA Cup that season, and scored in the second leg as Blackburn went out in the first round, losing to Trelleborgs FF of Sweden. His efforts for the club led to Shearer being awarded the PFA Players' Player of the Year for 1995. Although the club could not retain the title the following year, Shearer again ended the (now 38-game) season as Premier League top scorer, with 31 goals in 35 games, as Blackburn finished seventh in the league. The previous season's first-place finish also saw the club enter the Champions League. Shearer's only goal in six full Champions League games was a penalty in a 4–1 victory against Rosenborg BK in the final fixture and Blackburn finished third in their group, failing to progress to the next stage. He passed the 100-goal milestone for Blackburn in all competitions on 23 September 1995, scoring a hat-trick in their 5–1 home win over Coventry City in the Premier League. On 30 December, he scored his 100th Premier League goal for the club in a 2–1 home win over Tottenham Hotspur. His final tally for the club was 112 goals in the Premier League and 130 in all competitions. His final goals for the club came on 17 April 1996, when he scored twice in a 3–2 home league win over Wimbledon. Shearer's international strike rate had also dried up, with no goals in the twelve matches leading up to Euro 96. He missed the final three games of the season for his club due to injury, but recovered in time to play in England's UEFA European Championship campaign. After Euro 96, Manchester United again sought to sign Shearer, and attempted to enter the battle for his signature. However Manchester United chairman Martin Edwards stated that Blackburn Rovers refused to let Shearer go to Old Trafford. Ultimately Shearer joined his boyhood club and Manchester United's title rivals Newcastle United. On 30 July 1996, for a world transfer record-breaking £15 million (equivalent to £28 million today) Shearer joined his hometown club and league runners-up Newcastle United, managed by his hero Keegan. Shearer made his league debut away at Everton, on 17 August 1996, and maintained his form during the rest of the season, finishing as Premier League top-scorer for the third consecutive season with 25 goals in 31 Premier League games, as well as winning another PFA Player of the Year accolade, despite a groin injury forcing him to miss seven matches. Perhaps his best performance of the season came on 2 February 1997, when Newcastle went into the final 15 minutes of the game 3–1 down at home to Leicester City in the league, only for Shearer to win them the game 4–3 by scoring a late hat-trick. However, the league title still eluded the club, who finished second in the league for a consecutive year, with Keegan resigning midway through the season. Another injury problem, this time an ankle ligament injury sustained in a pre-season match at Goodison Park, restricted Shearer to just two goals in 17 games in the 1997–98 season. His injury was reflected in the club's form, and Newcastle finished just 13th in the Premier League. However, United (now managed by Shearer's old boss at Blackburn, Kenny Dalglish) had a good run in the FA Cup; Shearer scored the winning goal in a semi-final victory over Sheffield United as the team reached the final. The team were unable to get on the scoresheet at Wembley, and lost the game 2–0 to Arsenal. An incident during a game against Leicester City in the league saw Shearer charged with misconduct by the FA, with media sources claiming that video footage showed him intentionally kicking Neil Lennon in the head following a challenge. The referee of the game took no action against Shearer, and he was then cleared of all charges by the FA, with Lennon giving evidence in the player's defence. Former Football Association chief Graham Kelly, who brought the charges against the player, later claimed in his autobiography that Shearer had threatened to withdraw himself from the 1998 World Cup squad if the charges were upheld, a claim strenuously denied by Shearer. An almost injury-free season helped Shearer improve on his previous year's tally in the 1998–99 season, the striker converting 14 goals in 30 league games and replacing Rob Lee as Newcastle captain, but Newcastle finished 13th again, with Ruud Gullit having replaced Kenny Dalglish just after the season got underway. He also helped Newcastle to a second consecutive FA Cup final and qualification for the following season's UEFA Cup, scoring twice in the semi-final against Tottenham Hotspur, but they once again lost, this time 2–0 to treble-chasing Manchester United. On the opening day of the 1999–2000 season, Shearer received the first red card of his career in his 100th appearance for Newcastle. After dropping Shearer to the bench in a Tyne-Wear derby loss against Sunderland, the unpopular Gullit resigned to be replaced by the 66-year-old Bobby Robson. Despite Gullit giving Shearer the captain's armband, reports of a rift between club captain and manager were rife, Gullit's decision to drop Shearer proved deeply unpopular with fans and his departure capped a dismal start to the season. The animosity between Shearer and Gullit was later confirmed by the latter, who reported telling the striker that he was "...the most overrated player I have ever seen." Ironically, Robson had tried to sign Shearer for Barcelona in 1997, making a bid of £20million which would have seen Shearer break the world's transfer fee record for the second time in 12 months. However, then Newcastle manager Kenny Dalglish rejected the offer. In Robson's first match in charge, Shearer scored five goals in an 8–0 defeat of Sheffield Wednesday. With Robson in charge, the team moved away from the relegation zone, finishing in mid-table and reached the FA Cup semi-finals, but a third consecutive final was beyond them as they were beaten by Chelsea. Shearer missed only one league game and notched up 23 goals. Shearer suffered an injury-hit and frustrating season in the 2000–01 season, having retired from international football after the UEFA Euro 2000 tournament to focus on club football. He managed only five goals in 19 games in the league. The 2001–02 season was much better though: Shearer bagged 23 goals in 37 league games as Newcastle finished fourth — their highest standing since 1997 — meaning they would qualify for the following season's Champions League competition. One of the most memorable incidents of the season saw Roy Keane sent off after a confrontation with Shearer during Newcastle's 4–3 win over the Red Devils in September 2001. Shearer also saw red for the second time in his career this season, after allegedly elbowing an opposition player in a match against Charlton Athletic. The 2002–03 season saw Shearer and Newcastle make their return to the UEFA Champions League. Newcastle lost their first three matches in the opening group stage, but Shearer's goal against Dynamo Kyiv, coupled with further wins against Juventus and Feyenoord saw the club progress to the second group stage. —  Gabriel Batistuta on his admiration of Shearer, February 2003. Shearer's Champions League hat-trick against Bayer Leverkusen and a brace against Inter Milan in the second group stage helped him reach a total of seven Champions League goals, along with his 17 in 35 games in the league, and a total of 25 for the season as the team again improved to finish in third place in the Premier League. After this, Newcastle would have one more chance to progress in the Champions League in early 2003, but Shearer was one of those who failed to score as the team were eliminated in a penalty shootout by Partizan Belgrade in the third qualifying round. United progressed well in that season's UEFA Cup and Shearer's six goals helped the club reach the semi-finals, where they were beaten by eventual runners up Olympique de Marseille. Domestically he also had a good season, with 22 goals in 37 appearances, however could not prevent the club dropping out of the Champions League places to finish in fifth, qualifying once again for the UEFA Cup. Announcing that this would be his final season before retirement, Shearer's form in the 2004–05 season was patchy; alongside new signing Patrick Kluivert, he scored only seven goals in his 28 games as the club finished the season in 14th place. The club fared better in the cup competitions, however, eventually losing out to Sporting CP in the UEFA Cup quarter-finals and Manchester United in the FA Cup semi-finals. Shearer scored a hat-trick in the first round win against Hapoel Bnei Sakhnin, and ended the season with a haul of 11 European goals, in addition to his one goal in domestic cups. The middle of 2005 saw Shearer reverse his decision to retire, after persuasion from manager Graeme Souness. He decided to continue playing in a player-coach capacity until the end of the following season. and he returned for one more season in the 2005–06 season. This last season saw him break Jackie Milburn's 49-year-old record of 200 goals for Newcastle United (not including his 38 World War II Wartime League goals) when he netted his 201st strike in a home Premier League fixture against Portsmouth on 4 February 2006, becoming the club's highest-ever league and cup competition goalscorer with 206 goals altogether. On 17 April 2006, with three games remaining in his final season as a player, Shearer suffered a tear to the medial collateral ligament in his left knee after a collision during the 4–1 win at Sunderland in which he scored his 206th goal in what was his 395th appearance for the club. The injury caused him to miss those final three games, effectively bringing forward his retirement. Shearer finished his final season with 10 goals in 32 league games. Banner in tribute to Shearer outside St James' Park. Marking his 10 years at the club, it was displayed for three weeks during April and May 2006. In tribute to Shearer's contribution to Newcastle United over more than ten years, the club erected a large banner of Shearer on the outside of the cantilever superstructure of the Gallowgate End of St James' Park. The banner measured 25 metres (82 ft) high by 32 metres (105 ft) wide, covering almost half of the Gallowgate End, aptly placed above the club bar, Shearer's Bar, opened in his honour in 2005. The banner depicted Shearer as the "Gallowgate Giant", with one arm aloft in his signature goal celebration, with the message "Thanks for 10 great years", and was featured in the media coverage reflecting on his career at the club, with the banner being displayed from 19 April 2006 until 11 May 2006, the day of his testimonial match. The banner could be seen across the city and as far away as Gateshead across the River Tyne, standing taller than the iconic local landmark, the Angel of the North. 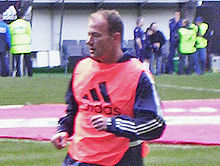 Shearer was awarded a testimonial match by the club, against Scottish side Celtic. All proceeds of the match went to charitable causes. Because of the injury he sustained three games earlier at Sunderland, Shearer was unable to play in the whole match; however, he kicked off the game and came off the bench to score a penalty, helping Newcastle win the game 3–2. The match was a sell-out, and saw Shearer perform a lap of honour at the end with his family, with his young son notably covering his ears due to the volume of noise produced by the crowd in tribute. Shearer's international career began in 1990 when he was handed a callup to the England under-21 squad under Dave Sexton. During his time with the squad, he scored 13 times in 11 games, a record return which is still unbeaten. The striker's goals at this level, coupled with his club form, meant he was soon promoted to the senior squad by coach Graham Taylor. Marking his debut in the 2–0 win against France in February 1992 with a goal, he made his only appearance for the England B team a month later. Due to replace Gary Lineker, who retired from international action after UEFA Euro 1992, in the England attack, Shearer played only intermittently in the qualifying campaign for the 1994 FIFA World Cup due to injury and the team failed to reach the competition finals. UEFA Euro 1996 was a more positive experience for both Shearer and England. With England not required to qualify as hosts, Shearer had not scored in 12 games in the 21 months prior, and even his overall goalscoring record for England did not look too impressive so far, with five goals in 23 games. However, he found the net in the 22nd minute of the first game, against Switzerland. Scoring once in the following game against Scotland and twice in a 4–1 win over the Netherlands, Shearer helped England to progress to the next stage in front of their own fans in Wembley. In the quarter-finals, England were outplayed by Spain but got through to a penalty shootout after a goalless draw. Shearer scored the first England penalty, while the Spaniards failed to score from two of theirs, sending England into the semi-final against Germany. Shearer headed England into the lead after three minutes, but the Germans quickly equalised and the match went to penalties again. This time, Germany won from the spot; although Shearer scored, his teammate Gareth Southgate missed his kick and England were eliminated. Shearer's five goals made him the competition's top scorer, and together with teammates David Seaman and Steve McManaman, was listed in the official UEFA team of the tournament. The new England manager Glenn Hoddle appointed Shearer captain for the 1998 FIFA World Cup qualifier against Moldova on 1 September 1996, and the player held onto the captaincy after scoring once in that match and twice in the following game against Poland. He scored a total of five goals in England's successful qualification campaign for the World Cup, adding strikes against Georgia and away to Poland to his tally. Shearer was sidelined for much of the 1997–98 season, but recovered to play in the World Cup finals. With Michael Owen replacing Teddy Sheringham as Shearer's strike partner, Shearer's return saw him score England's first goal of the tournament, in a 2–0 win over Tunisia, his only goal in the three group matches. England faced long-time rivals Argentina in the second round. Shearer scored a first-half equaliser from the penalty-spot before David Beckham was sent off early in the second half. In the final minutes of the game Sol Campbell headed in what could have been the winning goal only for the referee to disallow it due to Shearer having elbowed goalkeeper Carlos Roa. The scores tied 2–2, the game went to penalties. Shearer scored again, but England were eliminated after David Batty's shot was saved by the Argentina goalkeeper. This defeat ended England's participation in what was to be Shearer's only World Cup tournament. Shearer did not score in England's opening 3–2 defeat against Portugal, but did so as England defeated Germany 1–0 in Charleroi, ensuring that England beat their European neighbours for the first time since the 1966 World Cup Final. To remain in the tournament, England only required a draw against Romania in the final group match, and Shearer scored a penalty as England went in at half-time 2–1 up, but Romania ultimately won 3–2. England's tournament was over, and so was Shearer's international career. From his 63 caps, he captained the team 34 times and scored thirty goals; he is ranked joint-sixth in the England all-time goalscorers list with Nat Lofthouse and Tom Finney. Shearer remained in international retirement despite speculation of a return during the 2002 World Cup and 2004 European Championship campaigns, and further declined an offer to be assistant manager to Steve McClaren after the 2006 World Cup – a position ultimately filled by Terry Venables. As a player, Shearer was often styled as a classic English centre-forward, owing to his strength, physical stature, heading ability and strong shot, which enabled him to be highly prolific goalscorer. Of his 206 Newcastle goals, 49 were scored with his head. Earlier in his career, especially at Southampton, Shearer played a more creative role: providing chances for fellow strikers, and making runs into space, owing to his early development as a midfielder. Later on in his career, Shearer played a more forward role, after his age robbed him of some of his pace. Able to hold the ball up well, he often functioned as a target man, providing balls for other players. Although his strength allowed him to hold on to the ball, his playing style sometimes brought him criticism – most commonly that his play was too physical, and that he used his elbows too aggressively. It was this which contributed to both of his sendings off, although one was later rescinded on appeal. As well as the two red cards, Shearer received 59 yellow cards during his career. Shearer was noted as a proficient penalty taker for both club and country, and he scored 45 times from the spot for Newcastle, where he was the first-choice taker. He also scored five goals from free-kicks for the north-east club. On his retirement as a player, Shearer responded to speculation of an immediate move into coaching, saying that he would take some personal time off to "enjoy life" for the next couple of years. He was also quoted as saying that he would eventually like to move into management, "when the time was right" however as of March 2009 he was yet to start the UEFA Pro Licence course, which is required to be permitted to manage a team in the Premier League and European competition. Reflecting his desire for personal time off to "enjoy life", in July 2006 he turned down a coaching role with England, citing his BBC commitments and desire to be away from the pressure of a job within football. Despite this, Shearer was often linked in the media with managerial or coaching positions at his three former clubs. Shearer took a brief role in the dugout for his final three games under Glenn Roeder. Shearer had rejected offers of coaching or assistant roles at Newcastle under both the returning Kevin Keegan in February 2008 and Joe Kinnear in November 2008. Shearer had previously had talks about, but never been offered, a full-time manager's role at Newcastle until his appointment on 1 April 2009. In a surprise move, late on 1 April 2009, it was announced that Shearer would become the manager of his former club Newcastle United for the remaining eight games of the season, taking over from head coach Chris Hughton who was in temporary charge while the permanent manager Joe Kinnear recovered from heart surgery, having taken ill on 7 February. Shearer stated "It's a club I love and I don't want them to go down. I'll do everything I can to stop that." Shearer was unveiled at a press conference the following day by club managing director Derek Llambias. In explaining his acceptance of a managerial role at Newcastle at this time, Shearer stated that he would not have done this for any other club in this position, including his two other previous Premier League clubs. Amid persistent questioning regarding the permanency of the appointment, Llambias announced that Shearer was to be manager for the remaining eight games, and after his recovery, Joe Kinnear would return as manager after the end of the season. Shearer confirmed that the BBC had agreed to giving him an 8-week sabbatical from his Match of the Day role. Llambias also confirmed Dennis Wise had left his executive role at the club and the club had no plans to appoint a replacement, with Shearer stating that "the people that have moved, were moving on anyways, that had nothing to do with me". Wise's presence had previously been speculated as being a blockage to any possible appointment of a manager. Shearer accepted the surprise offer on the Monday on the condition that he could bring in Iain Dowie as his assistant. Shearer also brought in Paul Ferris to oversee club medical, physio and dietary matters. Ferris had previously worked with Shearer in his playing days, and had been at the club for 13 years prior to an earlier departure under then manager Glenn Roeder. His first match in charge ended in a 2–0 defeat against Chelsea at St James' Park. On 11 April, Newcastle earned their first point under Shearer with a 1–1 draw with Stoke City at the Britannia Stadium with Andy Carroll scoring a late equalising goal. After a defeat to Tottenham Hotspur and a draw against Portsmouth, his first win for Newcastle came in a 3–1 victory over Middlesbrough that lifted Newcastle from the relegation zone. On the eve of the final day of the season on 24 May, where all fixtures are played simultaneously, Newcastle faced the prospect of being relegated to the Championship, along with Hull City, Middlesbrough and Sunderland, which would end their 16-year unbroken spell in the Premier League. After losing 1–0 at Aston Villa with Damien Duff scoring an own goal, Newcastle were relegated with local rivals Middlesbrough, joining West Bromwich Albion whose relegation had been confirmed in previous weeks, while Sunderland and Hull City survived. Shearer's eight games yielded only five points out of a possible twenty-four. Shearer did not get the manager's job on permanent basis. Chris Hughton stepped up from the coaching staff to take charge of the quest to get Newcastle back into the Premier League, which was achieved at the first attempt as Newcastle finished top of the Championship in the 2009–10 season. Shearer is married to Lainya, whom he met whilst a Southampton player. The couple lived locally with her parents during Shearer's second year at the south coast club, and were married on 8 June 1991 at St. James' Church in the city. In contrast to the portrayal of some WAGs (wives and girlfriends) of later players by the media, Lainya is described by Shearer as a quiet and reserved person, not comfortable in the spotlight her husband's fame sometimes brought. The couple have three children. Shearer cited not wanting to uproot his family as a key reason for remaining in England during his career, having had the chance to move to Juventus or Barcelona when leaving Blackburn. Shearer's family accompanied him onto the pitch following the striker's testimonial in May 2006 as he performed a lap of honour at St James' Park. On 6 December 2000, Shearer was given Honorary Freedom of the City of Newcastle upon Tyne, with the citation "in recognition of his role as captain of Newcastle United Football Club and as former captain of England which have enhanced the reputation of the City". Shearer was appointed Officer of the Order of the British Empire (OBE) in the 2001 Queen's Birthday Honours and Commander of the Order of the British Empire (CBE) in the 2016 Birthday Honours for charitable services to the community in North East England. Shearer’s statue outside St James' Park, Newcastle. It features the prolific goalscorer with his usual goal celebration of one arm in the air. On 4 December 2006, Shearer was created a Doctor of Civil Law by Northumbria University, at a ceremony at Newcastle City Hall, where the University vice-chancellor declared that "Throughout his career Alan Shearer has been hard-working, committed, disciplined and focused in his endeavours, fighting back from career-threatening injuries with great determination and courage". On 1 October 2009, Shearer was commissioned as Deputy Lieutenant of Northumberland, having been nominated by the Duchess of Northumberland in her capacity as Lord Lieutenant of Northumberland, and approved for the position by the Queen. In this role, Shearer, along with 21 other deputies, is the stand-in for the Duchess when she cannot fulfill her role as the Queen's official representative in the region at official engagements. Deputies must live within seven miles of the county boundaries, and retain their appointment until age 75. The Duchess said of the appointment that "You could not find a more iconic person than Alan, not just for what he has done in football but for all the extra work he tirelessly does for charity and communities. I am delighted he has accepted the role of Deputy Lieutenant because he is a real role model. I have promised him he is not going to have to do too much, but even if it is just one occasion a year he is the perfect choice"
On 7 December 2009, Shearer was made a Doctor of Civil Law by Newcastle University. Chancellor Liam Donaldson stated "Newcastle United are my team. Alan Shearer is more than just a local legend, he's probably one of the greatest footballers of all time". 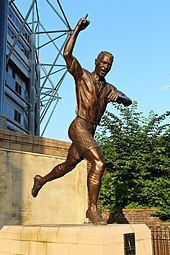 On 12 September 2016, a statue of Shearer's likeness was unveiled outside St James' Park. It was sculpted by Tom Maley, and paid for by the Shepherd family. After his retirement and following guest appearances, Shearer became a regular pundit for the BBC's Match of the Day. He also formed part of the team which covered the World Cups and European Championships from 2006 onwards for the BBC. Former Newcastle chairman Freddy Shepherd announced that, after Shearer finished the 2005–06 season as Newcastle's caretaker assistant manager, he would become the club's "Sporting Ambassador" for the 2006–07 season. However, in September 2008, it was reported that Shearer was removed from this largely honorary position by the club's owner Mike Ashley, despite protests from players such as Steven Taylor and Damien Duff, due to Shearer's criticism of the way in which the club was being run in the wake of the departure of Kevin Keegan. These reports were denied by the club. Shearer features in EA Sports' FIFA video game series; he was included in the FIFA 15 Ultimate Team Legends. During his playing days, Shearer had been involved with the children's charity the NSPCC, taking part in the organisation's Full Stop campaign in 1999. Since retiring from football Shearer has also done work for several charities both nationally and in the Newcastle area. In his testimonial match, he raised £1.64m benefiting fourteen good causes including £400,000 for the NSPCC and £320,000 for completion of the "Alan Shearer Centre", a respite care facility based in West Denton, Newcastle. In October 2006, he became an ambassador for the NSPCC, describing it as "the kick-off to my most important role yet". He has also worked with The Dream Foundation. In 2006, Shearer founded the Alan Shearer Academy Scholarship to aid the development of promising young players in the region. 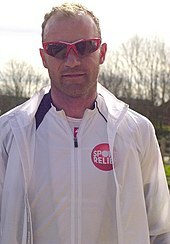 In 2008, he raised over £300,000 for Sport Relief in a bike ride with fellow Match of the Day presenter Adrian Chiles, the idea for which emerged in an off the cuff question from cycling fan Chiles to Shearer as to how he kept fit since retirement. Shearer also played and scored twice in Soccer Aid, a game involving celebrities and former players at Wembley Stadium in September 2008, to raise money for UNICEF. On 26 July 2009, Shearer played and scored in the Sir Bobby Robson Trophy match, a charity match held at St James' Park in tribute of Bobby Robson and in aid of his cancer charity the Sir Bobby Robson Foundation. It proved to be Robson's last public appearance, as he died five days later. On 15 October 2009, Shearer became the new patron of the Sir Bobby Robson Foundation. ^ Includes the UEFA Champions League main competition and qualifying, UEFA Cup main competition and qualifying and the UEFA Intertoto Cup. ^ Includes the Full Members Cup and the FA Charity Shield. Scores and results list England's goal tally first. "Score" column indicates the score after the player's goal. Turkey 2–0 4–0 1994 FIFA World Cup Qual. Moldova 3–0 3–0 1998 FIFA World Cup Qual. Poland 1–1 2–1 1998 FIFA World Cup Qual. Georgia 2–0 2–0 1998 FIFA World Cup Qual. Poland 1–0 2–0 1998 FIFA World Cup Qual. Sweden 1–0 1–2 UEFA Euro 2000 Qual. Luxembourg 2–0 3–0 UEFA Euro 2000 Qual. Bulgaria 1–0 1–1 UEFA Euro 2000 Qual. Luxembourg 1–0 6–0 UEFA Euro 2000 Qual. English Football Hall of Fame: 2004. ^ a b Whilst Shearer holds the record for goals scored in the Premier League, formed in 1992, the record for goals scored in the top flight in English football is 357, held by Jimmy Greaves. Shearer has scored 283 top flight goals, including 23 in the Football League First Division. - "England - All-Time Topscorers". Rec.Sport.Soccer Statistics Foundation. Retrieved 30 November 2017. ^ a b Hugman, Barry J. (2005). The PFA Premier & Football League Players' Records 1946–2005. Queen Anne Press. p. 556. ISBN 1-85291-665-6. ^ "Birthday Honours List, 2016". BBC. 10 June 2016. Retrieved 10 June 2016. ^ "Pele's list of the greatest". BBC. 4 March 2004. Retrieved 22 November 2013. ^ "Alan Shearer player info". Englandstats. Retrieved 8 August 2016. ^ "Pele's list of the greatest". BBC Sport. 4 March 2004. Retrieved 25 November 2013. ^ a b c d e f g h i Shearer, Alan (2007). My Illustrated Career. London: Cassell Illustrated. pp. 18–50. ISBN 1-84403-586-7. ^ a b c Duncan Holley & Gary Chalk (2003). In That Number – A post-war chronicle of Southampton FC. Hagiology Publishing. pp. 199–200. ISBN 0-9534474-3-X. ^ "Lundekvam Relishing Shearer Battle". Sporting Life. Archived from the original on 4 June 2011. Retrieved 15 August 2008. ^ a b c d Holley & Chalk (2003). In That Number. p. 577. ^ a b c d e f g h "Profile – Alan Shearer". Newcastle United F.C. Archived from the original on 6 February 2008. Retrieved 24 July 2008. ^ a b "Sad Farewell for Shearer". BBC Sport. 20 June 2000. Retrieved 15 August 2008. ^ Quoted in Holley & Chalk (2003). In That Number. p. 224. ^ Holley & Chalk (2003). In That Number. p. 224. ^ a b "S is for Shearer". The Football Association. 18 July 2007. Archived from the original on 10 December 2008. Retrieved 13 August 2008. ^ Winter, Henry (27 July 1992). "Shearer set to sign for Blackburn". The Independent. Retrieved 17 September 2014. ^ a b c d e f g h i Shearer, Alan (2007). My Illustrated Career. London: Cassell Illustrated. pp. 56–70. ISBN 978-1-84403-586-1. ^ "FWA FOOTBALLER OF THE YEAR AWARD". Football Writers' Association. Archived from the original on 19 September 2008. Retrieved 25 July 2008. ^ "USA 1994". BBC Sport. 17 April 2002. Retrieved 13 August 2008. ^ "1994/95". Premier League. Archived from the original on 14 May 2008. Retrieved 2 August 2008. ^ Barnes, Simon (21 April 2006). "A modest end befits Shearer, the extra-ordinary man who painted a masterpiece from creosote". The Times. London. Retrieved 10 March 2009. ^ "UEFA Cup First round". UEFA. Retrieved 2 August 2008. ^ a b Benammar, Emily (27 April 2008). "PFA Player of the Year winners 1974–2007". The Daily Telegraph. London. Retrieved 21 July 2008. ^ "A History of the Premier League". Premier League. Archived from the original on 18 November 2011. Retrieved 28 July 2008. ^ "today's top 20: most Premier League goals in a season (1992–2007)". The Independent. 21 September 2007. Archived from the original on 6 December 2008. Retrieved 26 July 2008. ^ a b "Season 1995/96". Premier League. Archived from the original on 30 October 2011. Retrieved 22 July 2008. ^ "UEFA Champions League Group B". UEFA. Retrieved 7 August 2008. ^ "Blackburn Statistics | Alan Shearer hits the net". Shearer9.com. 30 December 1995. Archived from the original on 16 October 2015. Retrieved 27 June 2014. ^ "Shearer Shearer". ffwd. Archived from the original on 4 November 2014. ^ "Record Transfer Sees Shearer to Newcastle". themoscowtimes.com. 30 July 1996. ^ Hughes, Rob (30 July 1996). "Newcastle United Pays Record $23 Million for Shearer". International Herald Tribune. Archived from the original on 27 September 2011. Retrieved 21 July 2008. ^ Randall, Colin (30 July 1996). "Shearer is going home for £15m". The Daily Telegraph. London. Archived from the original on 12 March 2005. Retrieved 21 July 2008. ^ "Alan Shearer Profile (NUFC Player Profiles)". Newcastle Online. Archived from the original on 25 July 2008. Retrieved 13 August 2008. ^ a b "Season 1996/97". Premier League. Archived from the original on 25 June 2008. Retrieved 21 July 2008. ^ "Season 1994/95". Premier League. Archived from the original on 16 September 2008. Retrieved 22 July 2008. ^ "The Top TEN Premier League Games Of All Time?". FootballFanCast.com. 11 June 2011. Retrieved 27 June 2014. ^ "Double time for Arsenal earns Wenger rich reward". The Daily Telegraph. London. 17 May 1998. Archived from the original on 27 May 2008. Retrieved 21 July 2008. ^ "Shearer charged with misconduct". BBC Sport. 7 May 1998. Retrieved 5 August 2008. ^ "10 of the worst...Fouls". ESPN Soccernet. 27 July 2005. Retrieved 5 August 2008. ^ "Shearer cleared in boot row". BBC Sport. 12 May 1998. Retrieved 5 August 2008. ^ "Shearer hits out at Kelly". BBC Sport. 7 September 1999. Retrieved 5 August 2008. ^ "Shearer factor is Ruud of all evil". The Guardian. 17 August 1999. Retrieved 14 March 2014. ^ "Gullit named Newcastle boss". BBC Sport. 27 August 1998. Retrieved 21 July 2008. ^ "Shearer sent off in 100th match". The Guardian. 8 August 1999. Retrieved 14 March 2014. ^ "Newcastle United's Ruud Gullit axed Alan Shearer before Sunderland defeat and paid with his job". The Telegraph. 25 October 2013. Retrieved 14 March 2014. ^ "Robson takes Newcastle hotseat". BBC Sport. 3 August 1999. Retrieved 21 July 2008. ^ Hodgson, Guy (27 August 1999). "Shearer's Doom Army at the gates of Gullit". The Independent. Retrieved 21 July 2008. ^ Turnbull, Simon (23 April 2006). "How a Toon totem lived the dream". The Independent. London. Retrieved 27 December 2008. ^ "Shearer's five star day". BBC. 19 September 1999. Retrieved 14 March 2014. ^ Malam, Colin (27 February 2000). "Shearer decides to quit England". The Daily Telegraph. London. Archived from the original on 11 September 2005. Retrieved 21 July 2008. ^ Aizlewood, John (6 February 2005). "The top 10 Roy Keane battles". The Sunday Times. London. Archived from the original on 9 March 2007. Retrieved 21 July 2008. ^ "Keane: I should have punched Shearer". BBC Sport. 14 November 2004. Retrieved 21 July 2008. ^ "Newcastle 2–1 Dynamo Kiev". UEFA. Retrieved 21 July 2008. ^ "2002 UEFA Champions League Group E". UEFA. Retrieved 21 July 2008. ^ "Batigol: Shearer is the greatest". Sky Sports. Retrieved 16 August 2018. ^ "Modern Magpies 2002/03: Champions League – We Had A Laugh!". Newcastle United F.C. Archived from the original on 12 January 2009. Retrieved 21 July 2008. ^ Stewart, Rob (14 January 2005). "Souness tries to talk Shearer round". The Daily Telegraph. London. Retrieved 21 July 2008. ^ Stewart, Rob (2 April 2005). "Newcastle say Shearer is manager in waiting". The Daily Telegraph. London. Retrieved 21 July 2008. ^ "Legends Jackie Milburn". Newcastle United F.C. Archived from the original on 7 October 2008. Retrieved 14 October 2008. ^ Taylor, Louise (4 February 2006). "St James' joy at Shearer record". The Daily Telegraph. London. Retrieved 21 July 2008. ^ "Injury forces Shearer retirement". BBC Sport. 22 April 2006. Retrieved 14 August 2008. ^ "Shearer Special". BBC News. 24 April 2008. Retrieved 30 January 2009. ^ "Shearer testimonial photos". BBC Sport. 11 May 2006. Retrieved 30 January 2009. ^ Turnbull, Simon (23 April 2006). "How a Toon totem lived the dream". The Independent. London. Retrieved 30 January 2009. ^ a b Stewart, Rob (12 May 2006). "Shearer earns tearful tribute". The Daily Telegraph. London. Retrieved 21 July 2008. ^ "England Under-21 Goalscorers". The Football Association. Archived from the original on 6 April 2005. Retrieved 22 July 2008. ^ "England Under-21 Caps". The Football Association. Archived from the original on 3 April 2005. Retrieved 22 July 2008. ^ "Shear Class". Football Association. 15 July 2005. Archived from the original on 21 August 2008. Retrieved 15 August 2008. ^ "Football photographic encyclopedia, footballer, world cup, champions league, football championship, olympic games & hero images by". Sporting-heroes.net. Retrieved 27 June 2014. ^ a b c d e f "1996 European Championship". The Football Association. Archived from the original on 4 July 2008. Retrieved 13 August 2008. ^ "Shearer targets World Cup comeback". BBC Sport. 3 December 1997. Retrieved 22 July 2008. ^ "England v Argentina revisited". BBC Sport. 29 March 2002. Retrieved 15 August 2008. ^ a b "2000 European Championships". Football Association. Archived from the original on 12 June 2008. Retrieved 15 August 2008. ^ "Alan Shearer profile". The Football Association. Archived from the original on 4 August 2008. Retrieved 7 August 2008. ^ "England legends". The Football Association. Archived from the original on 23 July 2008. Retrieved 24 July 2008. ^ Moore, Glenn (17 March 2003). "Shearer rules out playing again for England". The Independent. London. Retrieved 22 March 2009. ^ Corrigan, Peter (30 December 2001). "This year in sport: Enter Gazza & Shearer, exit O'Leary & Sven". The Independent. London. Archived from the original on 5 December 2008. Retrieved 22 March 2009. ^ "Shearer keeps England option open". BBC Sport. 25 June 2002. Retrieved 22 March 2009. ^ Stewart, Rob (23 December 2005). "Shearer given due encouragement to stay on". The Daily Telegraph. London. Retrieved 6 August 2008. ^ a b "The Shearer Era – Facts And Figures". Newcastle United F.C. Archived from the original on 8 October 2008. Retrieved 6 August 2008. ^ "Football Hall of Fame – Alan Shearer". National Football Museum. Archived from the original on 4 August 2008. Retrieved 6 August 2008. ^ Walker, Michael (12 April 1999). "Campbell's calamitous handiwork sees Shearer cash in to great effect". The Guardian. London. Retrieved 6 August 2008. ^ Collins, Roy (29 October 2005). "FA need to add more power to their elbow". The Daily Telegraph. London. Retrieved 6 August 2008. ^ "Eureka! Spot-on Shearer has formula for perfect penalty". The Northern Echo. 23 June 2006. Retrieved 12 August 2008. ^ "Shearer ready for spot-kick pressure". BBC Sport. 20 May 2000. Retrieved 6 August 2008. ^ "Shearer coy about England vacancy". BBC Sport. 24 November 2007. Archived from the original on 26 November 2007. Retrieved 24 November 2007. ^ "Shearer keeps England option open". BBC Sport. 25 June 2006. Retrieved 22 July 2008. ^ "The next generation". The Football Association. 4 July 2008. Retrieved 5 July 2009. ^ "It's time to close the door on unqualified coaches". Press and Journal. 27 June 2008. Retrieved 22 July 2008. ^ "Shearer rejects role with England". BBC Sport. 22 April 2006. Retrieved 13 August 2008. ^ Winter, Henry (10 January 2008). "No time for Allardyce; wrong time for Shearer". The Daily Telegraph. London. Retrieved 23 July 2008. ^ "Shearer declines Blackburn chance". BBC Sport. 11 June 2008. Retrieved 23 July 2008. ^ "Shearer turns down Magpies coaching role". FIFA. 2 February 2008. Archived from the original on 5 April 2009. ^ "Shearer 'rejects Newcastle role'". BBC. 29 November 2008. ^ a b c d e f g h i "Shearer – Toon job massive" ((embedded video) direct link). Sky Sport. 2 April 2009. ^ "Shearer confirmed as Magpies boss". BBC Sport. 1 April 2009. Archived from the original on 2 April 2009. Retrieved 2 April 2009. ^ "NUFC Statement – Alan Shearer". Newcastle United F.C. 1 April 2009. Archived from the original on 30 September 2012. Retrieved 22 January 2011. ^ Stewart, Rob (18 November 2008). "Alan Shearer unlikely to take Newcastle job while Dennis Wise is still at St James' Park". The Daily Telegraph. London. Retrieved 22 January 2011. ^ "Another Magpie flies the nest as fitness coach quits". Barclays Premier League. ESPN Soccernet. 14 November 2006. Retrieved 22 January 2011. ^ McNulty, Phil (4 April 2009). "Newcastle 0–2 Chelsea". BBC Sport. Archived from the original on 5 April 2009. Retrieved 4 April 2009. ^ "Stoke 1 – 1 Newcastle". BBC Sport. 11 April 2009. Archived from the original on 12 April 2009. Retrieved 12 April 2009. ^ Lawton, Matt (12 May 2009). "Newcastle 3 Boro 1: Shearer pulls a masterstroke as manager's gamble hits jackpot". Daily Mail. London. Archived from the original on 14 May 2009. Retrieved 13 May 2009. ^ a b "Newcastle relegated after final day defeat". CNN.com/world sport. 24 May 2009. Archived from the original on 27 May 2009. Retrieved 24 May 2009. ^ Shearer, Alan (2007). My Illustrated Career. London: Cassell Illustrated. pp. 162–222. ISBN 1-84403-586-7. ^ "Honorary Freedom – Citations". Newcastle City Council. n.d. Archived from the original on 1 October 2009. Retrieved 1 October 2009. ^ "Honorary Freemen (1977 to date)". Newcastle City Council. n.d. Archived from the original on 1 October 2009. Retrieved 1 October 2009. ^ Wildman, Rob (24 November 2003). "Newcastle quick to reap rewards". The Daily Telegraph. London. Retrieved 5 August 2008. ^ "Shearer the Geordie gem". BBC Sport. 15 June 2001. Retrieved 5 August 2008. ^ "No. 61608". The London Gazette (Supplement). 11 June 2016. p. B10. ^ "Queen's Birthday Honours: Alan Shearer & Alastair Cook made CBEs". BBC Sport. 11 June 2016. Retrieved 11 June 2016. ^ "Football legend receives degree". BBC News. 4 December 2006. Archived from the original on 1 October 2009. Retrieved 5 August 2008. ^ "Shearer appointed Queen's envoy". UK Press Association. 1 October 2009. Archived from the original on 1 October 2009. Retrieved 1 October 2009. ^ a b c "Alan Shearer made Deputy Lieutenant of Northumberland (page 1 of 2)". The Journal. 1 October 2009. Archived from the original on 1 October 2009. Retrieved 1 October 2009. ^ "Newcastle University's new chancellor honours his personal heroes". Newcastle University. 7 December 2009. Archived from the original on 7 December 2009. Retrieved 7 December 2009. ^ a b "Shearer dons rival colours". Associated Press. 7 December 2009. Archived from the original on 7 December 2009. Retrieved 7 December 2009. ^ a b "Shearer receives honorary degree". BBC. 7 December 2009. Archived from the original on 7 December 2009. Retrieved 7 December 2009. ^ "Alan Shearer statue unveiled at St James' Park". BBC News. 12 September 2016. Retrieved 7 February 2017. ^ Caroe, Charlie; Edbrooke, David (9 June 2008). "Alan Shearer keen on Blackburn Rovers post". The Daily Telegraph. London. Archived from the original on 5 June 2011. Retrieved 22 July 2008. ^ a b Young, Colin (15 September 2008). "Alan Shearer is kicked out as Mike Ashley reveals details of Newcastle's cash crisis". Daily Mail. London. ^ "Magpies dismiss Shearer sack talk". BBC Sport. 15 September 2008. Retrieved 10 March 2009. ^ "Alan Shearer's Charity work". Look to the stars. Retrieved 8 April 2009. ^ "FIFA 15 Player Ratings - FIFA Ultimate Team Legends". EA Sports. Retrieved 10 April 2015. ^ a b "NSPCC Ambassador Alan Shearer OBE". NSPCC. Retrieved 24 July 2008. ^ "Centre is named after Toon legend". BBC News. 11 May 2008. Retrieved 24 July 2008. ^ James, Paul (9 February 2007). "Shearer's gift is a new way to care". Journal Live. Retrieved 24 July 2008. ^ Stokes, Paul (19 July 2001). "Charity leaders held over 'missing funds'". The Daily Telegraph. London. Retrieved 24 July 2008. ^ "Shearer donates testimonial proceeds to charity". Ireland Online. 28 March 2006. Archived from the original on 8 January 2009. Retrieved 24 July 2008. ^ "Football duo finish charity ride". BBC News. 14 March 2008. Retrieved 24 July 2008. ^ "Football match honours Sir Bobby". BBC News. 26 July 2009. Archived from the original on 31 July 2009. Retrieved 29 July 2009. ^ "Football legend Robson dies at 76". BBC News. 31 July 2009. Archived from the original on 14 March 2016. Retrieved 31 July 2009. ^ "Robson cancer fund at £2m: Shearer". UK Press Association. 15 October 2009. Archived from the original on 15 October 2009. Retrieved 15 October 2009. ^ "Alan Shearer - Premier League playing career". Premier League.com. Retrieved 16 August 2018. ^ "Alan Shearer - Goals in International Matches". Rec.Sport.Soccer Statistics Foundation. Archived from the original on 5 February 2015. Retrieved 27 June 2014. ^ a b c d "Alan Shearer: Overview". Premier League. Retrieved 18 April 2018. ^ "Torres receives adidas Golden Boot". UEFA. Retrieved 21 January 2015. ^ "1996 team of the tournament". UEFA. Retrieved 21 January 2015. ^ "Ronaldo honoured at Lisbon Gala". FIFA. Retrieved 21 January 2015. ^ "Hall of Fame – Alan Shearer". National Football Museum. Archived from the original on 22 June 2008. Retrieved 26 July 2008. ^ "Fifa to unveil 100 greatest". BBC Sport. 4 March 2004. Retrieved 26 July 2008. ^ "Shearer nets awards". BBC Sport. 14 April 2003. Retrieved 26 July 2008. ^ "Newcastle reach Champions League". BBC Sport. 3 May 2003. Retrieved 26 July 2008. ^ "Your overall Team of the Century: the world's greatest-ever XI revealed!". GiveMeFootball.com. Give Me Football. 6 September 2007. Archived from the original on 21 October 2008. Retrieved 18 May 2016. ^ a b c d "For the record: Premier League facts and figures". Premier League. 11 March 2018. Archived from the original on 31 March 2018. Retrieved 3 April 2018. ^ Held jointly with Andy Cole. ^ Held jointly with Sergio Agüero, Dimitar Berbatov. Jermain Defoe and Andy Cole. ^ a b "Goal Machines". Newcastle United F.C. Archived from the original on 22 November 2008. Retrieved 26 July 2008. 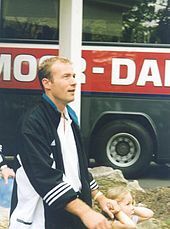 Wikimedia Commons has media related to Alan Shearer. "Alan Shearer profile at 4thegame.com". Archived from the original on 13 February 2006. Retrieved 18 March 2006. "Interview with Alan Shearer at vidFootball.com". Archived from the original on 28 September 2007. Retrieved 13 July 2007.